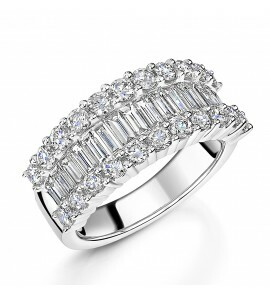 Beautiful diamond ring is set with a mix of brilliant and baguette cut diamonds. The ring features a row of 20 tapered baguette cut diamonds with a combined weight of 0.45ct between a row of 20 brilliant cut diamonds weighing a total weight of 1.16cts. Hallmarked 750 18ct white gold shank. 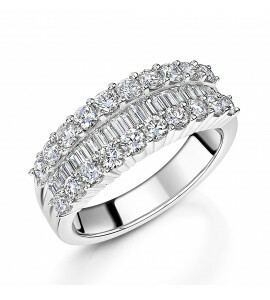 Total car..
Beautiful diamond ring is set with a mix of brilliant and baguette cut diamonds. The ring features a row of 16 tapered baguette cut diamonds with a combined weight of 1.01ct between a row of 22 brilliant cut diamonds weighing a total weight of 1.16cts. Hallmarked 750 18ct white gold shank. Total car..